Saral Gyan team wishes you Happy & Prosperous New Year 2015! We are pleased to inform you that we have received an overwhelming response from our readers for our Merry Christmas - New Year 2015 Offer which will close today at 11.00 PM. Since 2010, Saral Gyan team has successfully published hundreds of articles providing insight to equity market and today cherish association of more than 15,000 members. Articles published on our website received lot of appreciation as it helped our readers to make educated and smart investment decisions based on facts. During past 4 years, we launched suitable services to help Investors to create wealth by investing in Indian stock market. Its appreciation and support of our readers that one of our most admired service - Hidden Gems ranks on top not only in performance but also on Google search engine. If you search "Multibagger Small Caps" or "Hidden Gems Stocks" on Google, you will find our website www.saralgyan.in featuring on top in search results. Its your appreciation and word of mouth publicity which make our website featuring on 1st position in Google. In an attempt to ensure that we pass on the maximum benefits to our readers, we are celebrating Christmas & New Year Eve with Saral Gyan Merry Christmas - New Year 2015 Offer by offering maximum discounts and freebies on our subscription services. During this festive season, you can enjoy great savings and valuable freebies by grabbing the best deal. 4. Saral Gyan eBook - "How to Grow your Savings?" worth Rs. 599 for Free. Below table indicates subscription services and discounted prices valid up to 31st Dec'14. Simply choose the subscription service / combo subscription you would like to opt and click on SUBSCRIBE! link in above table to make online payment using your debit / credit card or net banking facility. If you are not comfortable in subscribing online, click here to know about our other payment options and bank details. Click here to know more about Merry Christmas - Happy New Year 2015 Offer. Time has shown that smart investors have made their fortune by investing in equities in long term. None other asset class can match giving you such extra ordinary returns. Yes, its important for you to invest in right set of companies at right price. Start investing in Hidden Gems & Value Picks of stock market to get rewarded by creating a Wealth-Builder portfolio in long run. Remember, "If you want your Money to Grow, Equities is the only Way to Go" in long term. If you think to invest in stocks for period of 3 months or 6 months, we suggest you to stay out of stock market because you are not investing, you are betting on volatility of stock market which could be risky. Its our mission to ensure that you reap the best returns on your investment, our objective is not only to grow your investments at a healthy rate but also to protect your capital during market downturns. We also take this as an opportunity to share the returns on investment given by one of our most admired service Hidden Gems, during last 4 years. Hidden Gems (Unexplored Multibagger Small Cap Stocks) continue to shine giving as on date average returns of whopping 271% to our Hidden Gems subscribers compared to 49% returns of small cap index during last 4 years. It gives us immense pleasure to inform you that 24 Hidden Gems out of 36 have given more than 100% returns to our members during last 4 years. 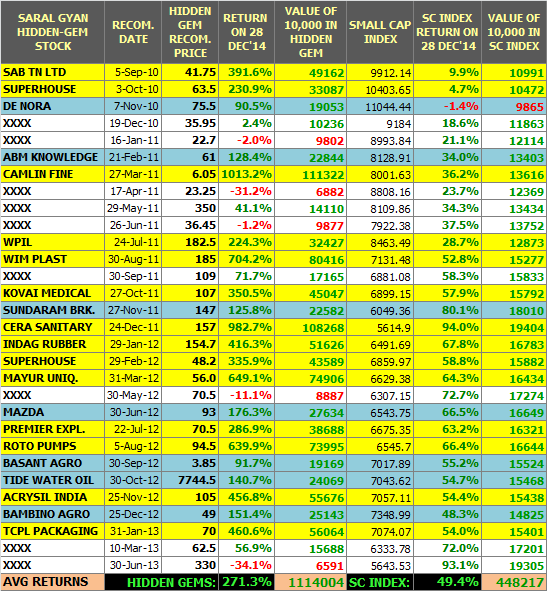 Moreover, 15 stocks out of these 24 have given returns in the range of 200% to 1000% during the same period. We are confident that we will continue to hunt best Hidden Gems from universe of small caps by doing authentic, in-depth and unbiased research work and support our members to make educated investment decision. Through Hidden Gems and Value Picks, we're providing you opportunities to invest in such small / mid caps stocks today. Infosys, Pantaloon, Unitech, Glenmark were the small cap stocks in past and today are the well known companies falling under mid and large cap space. The stocks we reveal through Hidden Gems & Value Picks are companies that are either under-researched or not covered by other stock brokers and research firms. We keep on updating our subscribers on our past recommendations suggesting them whether to hold / buy or sell stocks on the basis of company's performance and future outlook. Moreover, under our Wealth-Builder service, we encourage our members to replicate our Wealth-Builder portfolio by investing in selective high quality small and mid cap companies. These companies are reporting 20-30% + annualized growth and got their due share of re-rating and delivered exceptional returns to our members so far. Since 1st Jan 2013, Nifty has given returns of 38.6%, Sensex returns is 41.5% where as Wealth-Builder portfolio has given returns of 189.5% returns to our members. In case you have not yet started building a portfolio of high quality and fundamentally strong growth stocks for long term wealth creation, please find below the Wealth-Builder portfolio allocation & performance update for your reference. We believe, investing in Wealth-Builder portfolio with regular portfolio review from our end can help you achieve market beating, very good returns over a longer team and help you take care of yourself and your family needs, which ultimately lead to a healthy and wealthy life after retirement. 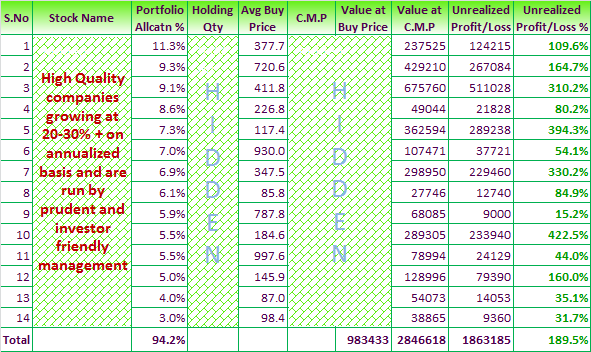 Now you can add power to your equity portfolio by investing in best of small & mid cap stocks - Hidden Gems & Value Picks. Enjoy great savings and receive valuable freebies during Saral Gyan Merry Christmas - Happy New Year 2015 Offer by availing subscription of our Hidden Gems, Value Picks & Wealth-Builder services. Hurry! 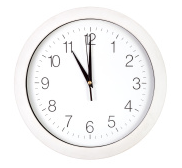 Last few hours... Offer will disappear today at 11.00 pm. Click here for details. Note: Merry Christmas - Happy New Year 2015 Offer is for limited period and closes on 31st Dec'14 at 11.00 pm. Subscription cycle for all new subscribers joining on or before 31st Dec 2014 will be Dec 2014 - Nov 2015.